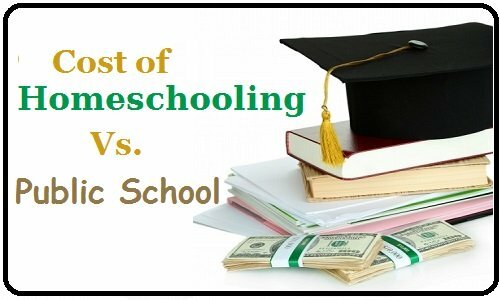 When you compare the cost of homeschooling vs public school expenses per year, you may be very shocked at the difference. Yes, the government is currently shelling out an average of well over $10,000 for every single child in the public school system. That is per year, not per their entire educational career. Once you learn that number, you may be quite shocked to hear that many homeschooling families spend less than $1,000 a year to educate ALL of their children. Those only homeschooling a couple children can often do it for just $500 a year, all children included. Many public and private schools send home a list of supplies and requirements for parent to purchase in the summer each year that actually exceeds this cost! A 2011 survey by the National Retail Federation found out that an “average the American family will spend $606.40 on clothes, shoes, supplies and electronics” for back to school! Then you add in the costs for field trips, school lunches, and paid sports, a public school parent has actually spent more than the average homeschooling parent does on all expenses combined! Considering that the public schools already have parents helping with the costs of supplies, why are these overall costs so different? It comes down to the nature of homeschooling versus the nature of public schools. Parents are not being paid to teach their children. They do it out of love and seeing their children grow up successfully is their paycheck at the end of the day. Public schools have to bring teachers in for money, so it is more of a business transaction. Parents do not have to purchase or rent out facilities to teach their children in. They teach where they live. Public schools have to pay for large buildings, buses, and tons of equipment. Homeschooling parents tend to buy what is needed and nothing more. Schools have a lot of waste in their budgets. The real reason public schooling is so expensive really comes down to this final point. Money is often wasted on needless equipment, large principal salaries and large teacher pensions. The homeschooling parent is willing to do the teaching for no financial compensation and they do not demand fancy equipment. They put on the hat of Principal and teacher without demanding that huge salary in exchange. Textbooks and curriculum for each child, each year. Basic school supplies such as crafting tools, paper and pencils. Tables and chairs with space for completing the teaching sessions and work. Another thing that brings the cost down for homeschooling is the willingness for parents to share and recycle. For instance, curriculum and textbooks can be passed down from one child to the next or sold to another family at a discounted price. The library can be used for Internet access if needed. Field trips can often be carried out for free or very low financial investment. It does not have to cost more than $1,000 a year to educate a child. Parents that are willing to purchase secondhand, network with other homeschooling families, and cut expenses wherever possible, will find homeschooling to be a very affordable option. There may be more extra expenses as a child gets into the high school years and needs more resources from outside the home, but the total yearly expenses should still be very close to $1,000. In many cases, it will remain under that even during the high school years. He who has the fattest pockets does not always produce the most talented, most successful, talented child! Homeschooling families have proven that with their test scores that outshine students from public schools.